A 5-year-old burn victim who lost his family in a firebomb attack on his home was treated to a special day with his favorite sports team. Ahmed Dawabsha, a Palestinian child, lost his parents and 18-month-old brother in an attack on their home in the West Bank by suspected extremists in July 2015. After spending months in the hospital recovering, Ahmed was given the chance of a lifetime after Spanish soccer giants Real Madrid heard about his plight. 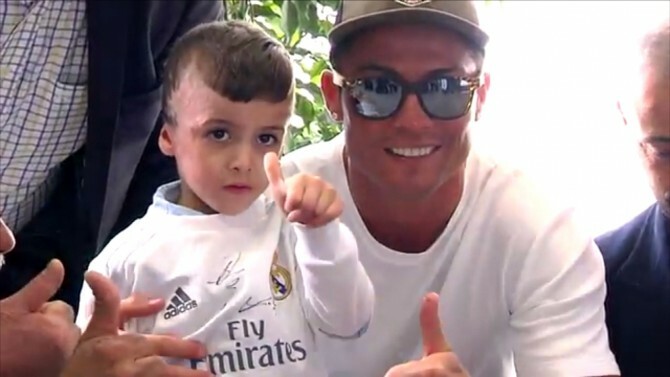 On Thursday, his favorite team flew him from Jordan's capital Amman to Madrid, where he met the team and posed with his favorite player, Cristiano Ronaldo. The boy is still recovering from his wounds and has scars around his head and face. Ahmed got the chance to run around the iconic Santiago Bernabeu stadium and pose for pictures with his new famous friends. The initiative was spearheaded by the team's coach, soccer legend Zinedine Zidane. Palestinian Football Association president Jibril Rajoub told IBTimes: "There is an unknown soldier in this initiative and that is Zinedine Zidane, who we warmly thank." This indeed is the beautiful game at its finest.